In view of the unemployment in today's time, every human being is in search of a job and if a government job is found then what to say is also in his field. But there are many such people who have left government and private jobs and made a separate identity of themselves and one of them is Harish Dhanadev - Harish Dhandev Jaisalmer. Harish left the government job and gave a challenge to his own life and fulfilled it. Such a thought- Harish was born in Jaisalmer and in year 2012, Harish took a B.Tech degree from a college in Jaipur and after that he went to Delhi to do an MBA but in the meantime he got a job as Jr. Engineer Jaisalmer Nagarpalika and Quit the MBA and began to work. Just a few months later, his mind got bored with the job and started thinking about separating something. After this, he kept thinking about many things that did not end, but the idea was coming. Once he went to an Agricultural University where he got the idea of ​​cultivating Aloe vera and he started thinking of doing this work. 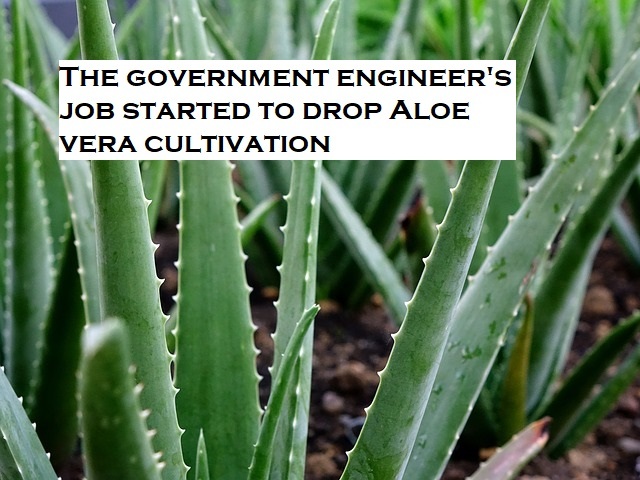 Now they felt that they would cultivate aloe vera and decided it too. Farming started- Harish went to Bikaner and brought about 25 thousand plants of Aloe Vera from there and planted them in Dhaisar, about 45 kilometers from Jaisalmer and named the company "Naturello Agro". Many people said that they would not cultivate this because if it had not succeeded in this area earlier then how will it happen but Harish had now made the idea of ​​doing it. Harish did the farming but there were no purchasers of any kind, which was not going to cost. But they did not give up and continued to do so. Own marketing- Harish made an idea of ​​marketing himself and started connecting with many people. He got himself in the field, met the people and sold him Aloe Vera in different prices but he was in the idea of ​​doing something big. Turning Point - In the life of every person something happens to something that makes it go to the sky or brings it to the ground. That's what happened to Harish. He was looking for a day, which of the firms which buy a large quantity of Eloversa pulp and came to their attention, Patanjali. He sent the mail to Patanjali and the answer came from there and his representatives came to meet and the matter became. Today, Patanjali is India's largest buyer of Aloe vera and Harish is the most selling Elovera. The work went on increasing and Harish decided to do it professionally and took charge. After that he continued moving forward. Today, his company's annual turnover is about two crore rupees and the country is supplying aloe vera abroad. Harish started cultivating ten bigha land, which has become 120 acres today. Today Harish's story is in the words of people around the world and people visit them and try to know about them.